29th September 2014. 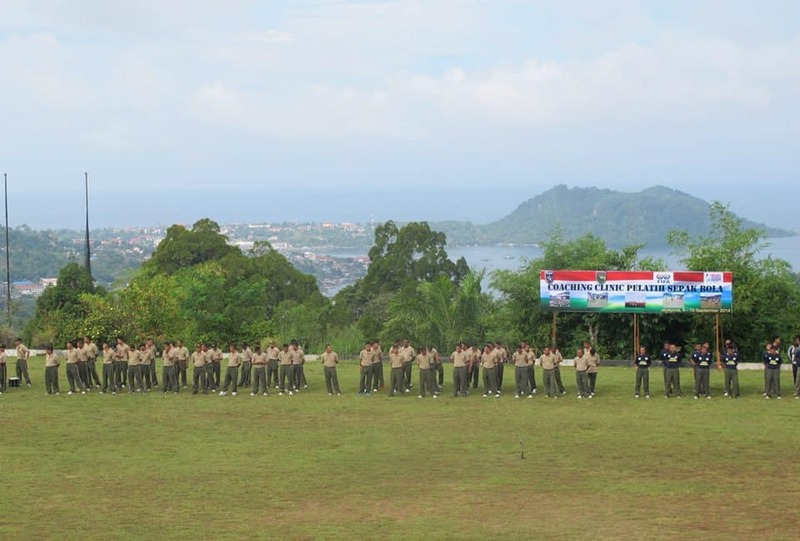 General Eduard greets us at the field at the Kodam XVII jayapura army base overlooking the serene landscape of Cenderiwasih Bay. Down below the stadium seats, a training drill field holds army men, civilian coaches, a marching band and 2 local football youth teams that are suited up and ready to play a short game of futbol following the ceremony. We are treated to cake and pastries, a common Papuan snack during and after training sessions, and we are accompanied by several army chiefs. After joining the men on the field for the opening ceremony, Cenderawasih, a club team coached by some of the coaches we will be working with, played against another local club team. This year was CAC’s first time holding a clinic at the Jayapura army base. Thirty nine participants attended; a mix of army and civilians. I was curious to see how they would respond to the self-directed learning approach to coaching as it is a different way of learning than they are accustomed to in their structured lives. The coaches adapted well and were quick to take in information and respond. Although the clinic only ran for 3 days, we were impressed to see their willingness to run the morning school sessions on their own by the third day. I am confident that the coaches have learned enough of the curriculum to start implementing change where they see fit in their communities. An area of focus for us in Papua has been smoking and the high rates of HIV/AIDS. Chain smoking in Papua is very common, especially in the military. The smell of burning plastic and cigarette smoke is almost impossible to escape here. One thing I have particularly noticed while traveling through Indonesia is how uninformed people are when it comes to their health. One man told me he smokes to concentrate better, another told me he smokes so he doesn’t fall asleep when driving. Although uninformed about the actual effects of smoking, it is still clear on every cigarette package that smoking kills. Our discussions about smoking always seem to end with Brian and I encouraging them to be good role models by never smoking in front of their players. The message seemed to reach them as many applauded at the end of several discussions. The Adebayor against HIV/AIDS games raised many questions as well. Many of the coaches were parents as well as coaches, which explained why there were a lot of concerns. Our Adebayor games were created to demonstrate how healthy educated decisions can stop the spread of HIV. After a question and answer filled Adebayor session, I am confident that the majority of these coaches will use our Adebayor and health and wellness games with their teams. Since talking about HIV is stigmatized, playing these games are a great way to start the discussion and create a safe space to talk about it. The Conflict Resolution games seemed to have a great impact on this group as well. Mingle Mingle and Marta for Conflict Resolution are both energy filled games that they all loved. Both games require quick thinking and problem solving, with incentive not to lose. Marta for Conflict Resolution is a game where 6 teams line up facing each other in a circle. Each player on the team has a different number from 1-6. When your number is called, you run around the front cone, continue around your team and around the circle until you reach your starting position. There are several variations where you can add a ball, call out two numbers at the same time, and give instruction to pick up the ball at the same time. A lot of cheating arises in the game which calls for teachable moments. Coaches learn the significance of teaching their players the difference between cheating and making a mistake and they also learn that in order to solve problems in life, we must communicate and work together. It was great to see collaboration between the army, Uni Papua and the local communities. 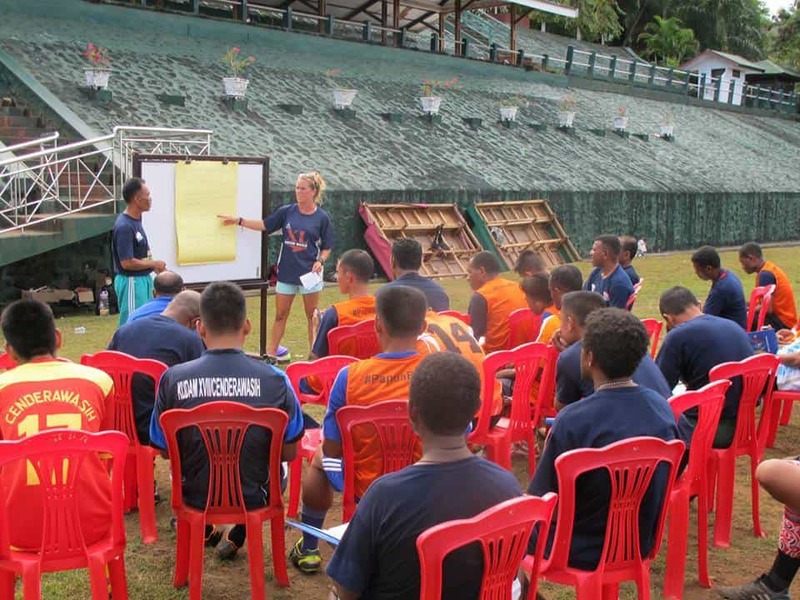 Huge steps can be taken before CAC comes back to Jayapura next year if the army coaches implement the 24 week curriculum into their practice plans and push their players to think independently and solve their own problems. The future of Jayapura looks promising as the coaches have already started to understand self-directed learning after three practice sessions with us and were determined to show us what they learned at the sessions at the schools every morning. As I continue to learn about the Papuan culture my appreciation for the people of this country grows. Uni Papua have been so generous and absolutely lovely to work with. Yanti and Kalin in Sentani treated us like family during our 10 short days working with them, and after sharing our last meal with Eduard’s family the night before our departure from Jayapura, we were taken to a karaoke bar. Brian and I sang “Ironic” by Alanis Morisette which was a highlight of my night; but a close second was the the dan-dout traditional Papuan dance performed by Eduard’s wife and daughter. Although we only had three days in Jayapura, our work on the field was extremely productive. We worked with a group of bright individuals who are great role models for Papua and I believe they will have a strong influence on Papuas future leaders.